Follow the tips here to pack a safe and nutritious lunch. Whether you carry your lunch in a box or a bag, keep it nutritious and safe. A carefully packed lunch can provide many of your daily nutritional recommendations. Brown bags actually are the second choice for transporting foods. Insulated lunch boxes protect foods from being crushed and help keep them at safe temperatures. Insulated lunch bags also help hold foods at safe temperatures. A mishandled lunch can cause foodborne illness. Be especially careful about potentially hazardous foods such as meat, cream-based foods and mixtures of food. Follow these tips to pack a safe and nutritious lunch. • Are there cooking facilities, including a microwave oven? If not, do not pack foods that need to be heated. • Is a refrigerator available for cold storage of food? If not, pack nonperishable items or include a frozen gel pack or frozen drink box to help keep food at safe temperatures. • Wash hands thoroughly before preparing lunches. • Keep utensils and countertops used in preparing lunches clean. • Thoroughly wash any thermos that carried hot foods (soup, chili, leftover casseroles) or cold foods (milk, etc. ); rinse with boiling water. • Wash fresh fruits and vegetables thoroughly with plenty of running water. • Many sandwiches freeze well and will thaw by lunchtime if placed in a lunch box early in the morning. Save time by preparing and freezing some extra sandwiches ahead of time. Don’t overdo the butter or mayo because the bread may become soggy during thawing. Sandwiches containing fruit or vegetables generally don’t freeze well; pack ingredients such as lettuce and tomato separately. • Keep gel packs or juice boxes in the freezer. Just before leaving home, place one in your bag or box. It should keep perishable food safe until lunchtime whether in a brown bag or lunch box. • To transport hot foods such as soup or chili, rinse a thermos with boiling water just before filling it with boiling-hot food. • Keep lunches out of the sun, inside a classroom or in the coolest possible place. • Don’t save perishable leftovers from your lunch, such as meat sandwiches or leftover soup. • Don’t reuse brown bags because bacteria can grow and contaminate tomorrow’s lunch. • Discourage children from “trading” lunches; there’s no way of knowing if the traded lunch was properly prepared and safely stored. • A nutritious lunch could contain two servings of grains, a serving of vegetables, a serving of fruit, a serving of protein foods and a serving of dairy. Go easy on high-fat foods, such as potato chips, which provide few nutrients. For active children, an occasional dessert also is a welcome addition to lunches. • Eat a variety of foods every day. Try new combinations of foods so lunches don’t become boring. • If the lunch is for a child, encourage him or her to help with the preparation. Most box lunches begin with a sandwich, but sandwiches don’t have to be routine. The possibilities are endless. Add some creative fillings to make them nutritious and delicious. 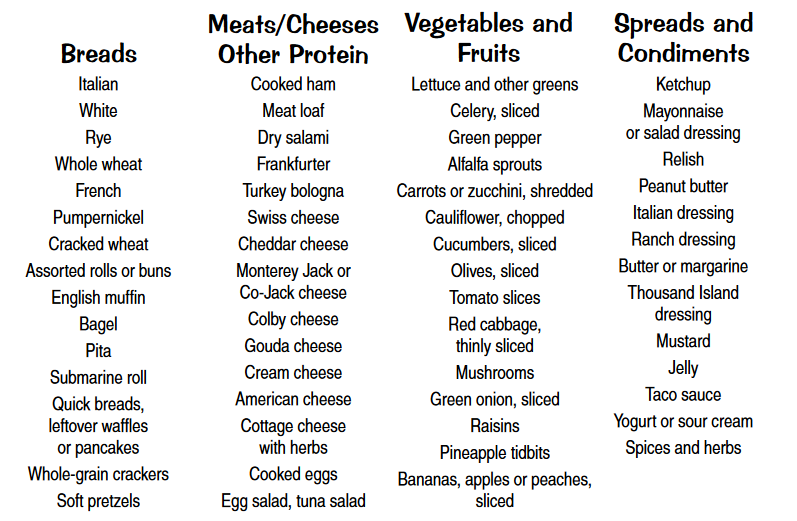 Use the following chart for some possibilities for mix-and-match sandwiches. *Choose a bread from the first column, add a meat or cheese selection from the second column and top it with vegetables, fruits and/or condiments of your choice. Remember to go easy on high-fat spreads, such as butter, margarine and mayonnaise. 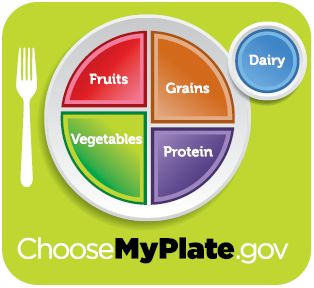 For more information about nutrition and food safety.